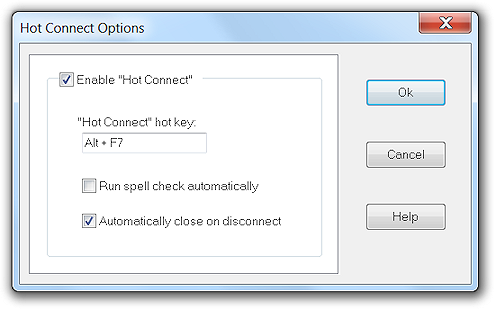 The Hot Connect feature can only be activated by pressing the Hot Connect hot key. Alt+F7 is the default hot key, but it can be changed by entering a different key in the provided box. To specify a different hot key simply click in the box and then press the key you want to use as the new hot key along with any combination of the Alt, Ctrl, and Shift keys. For example, if you want to change the Hot Connect hot key to Alt+Ctrl+H then click in the box and press the Alt, Ctrl, and H keys. When the Hot Connect feature is activated Jarte automatically runs its spell checker against any text transferred over from the connected text window. The Run spell check automatically check box can be unchecked if that behavior is undesirable. Note that if background spell checking is enabled then the regular spell checker is not automatically started. Check the Automatically close on disconnect check box if you want Jarte to automatically close a Hot Connect tab once it detects the tab's hot connected window is no longer available. There are a few uncommonly used Hot Connect settings provided in case problems are encountered while using Hot Connect. See Hot Connect Settings in the advanced settings section for more information.